There is a reasonable amount of talk about Irish crime fiction being the next big thing (though the South Africans, the French, the Scottish and the Italians are also champing at the bit). I’ve no clue who will win out (frankly I wish we wouldn’t have any more big things; as a reader I’d rather we had loads of good things from all over instead of focus being on one small region to the point that a fifth-grader’s, dog-chewed story can get published as long as the fifth-grader’s name is something like Sven Jorgensson and he can claim a Scandinavian heritage but I’m digressing already) but I can see one obvious difference between the currently popular Scandinavian crime fiction wave and the Irish contenders. Irish crime writing is far more heavily dominated by male writers. I do know that 2013’s Irish crime book of the year went to Louise Phillips’ THE DOLL HOUSE but in a 2011 ‘six of the best Irish crime novels’ list The Telegraph only listed one by a woman (Tana French) and on Good Reads a list of 28 popular Irish crime novels only 4 are by women (all Tana French). Brian McGilloway, himself an Irish crime writer of note, has three female writers who aren’t Tana French on his 2009 list of Top 10 modern Irish crime writers and French also makes an appearance to bring the total of female writers to just under half which is not bad but last November’s Festival of Irish Crime fiction appears to have featured 16 Irish crime writers (there are 17 on the list but Michael Connelly is a ring-in) of whom only 4 are women. I get a fair number of my reading recommendations from Irish crime writer and book reviewer Rob Kitchin but it was actually seeing his that on his list of 20 books (mostly crime) by Irish authors read in 2013 only 3 were by women that prompted me to embark on a sort of Irish women crime writers challenge (a very personal and unofficial version of the Australian Women Writers Challenge of which I am a co host). 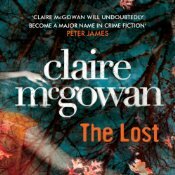 I’ve got a copy of the obviously popular Tana French’s BROKEN HARBOUR in my TBR pile but the 700 page brick size of the thing been putting me off for a couple of years so I thought I’d start with one of the women writers from Rob’s list which is why I downloaded the audio version of Claire McGowan’s THE LOST. It is the story of Paula Maguire, a successful (if rule-breaking) forensic psychologist who specialises in missing persons cases. Although working in England when the book opens it is not long before she is drawn back to Ballyterrin, the fictional border town in Northern Ireland where she was born. There a new unit has been established to investigate cold missing persons cases, of which there are a disproportionately high number due to the bureaucratic and political issues associated with policing in the border region. However there’s a current case of two missing girls which the unit becomes involved with due to resourcing issues and a potential link to an old case and Claire is asked to act as a consultant to the team. Probably the most notable and well-realised element of this novel is its setting. The tension between the current, forward-looking Ireland and the past with all its turmoil is palpable, with many characters having long memories which influence their behaviour and actions. The cases, especially the older cases that Paula becomes keen to look into in more depth, prove to have a particularly Irish flavour to them as the investigation starts to narrow in on a religious sect that has operated in the region and possible links to the disappearances and mistreatment of young, pregnant women. There is a very realistic feel to the ebbs and flows of this element of the novel, with some people wanting to be ‘over’ the past (or at least to look as if they are) and others still wanting old issues resolved. I liked the range of characters too with Paula being ably supported by a grouchy father (a former police officer), an old boyfriend turned local newspaper editor and a suitably engaging group of colleagues. Although it started strongly the story itself was, overall, a bit messy and underdone for my tastes, drawing heavily on the standard tropes of the genre and not really taking them anywhere original. Especially towards the end, when Paula’s boss’ family becomes involved in the case and Paula engages in a series of increasingly daft and perilous actions, I was rolling my eyes a bit at the soap opera quality. That said the resolution to the main case does hang together credibly and I was definitely engaged enough to keep reading. On balance then my first read for my unofficial challenge to track down crime fiction by Irish women writers has been a success. I particularly enjoyed the contemporary Irish feel and it was good to see that some of the social issues that were touched upon, such as the treatment of gypsy families, had nothing at all to do with the Troubles. This entry was posted in book review, Claire McGowan, Ireland. Bookmark the permalink. Bernadette – I always wonder about this whole ‘next big thing’ movement. I suppose to me good crime fiction is good crime fiction, wherever its origin. I’m glad you thought this one was an overall good read and I give you credit for embarking on this personal challenge. I’ll be interested to see what you review as a part of it. I don’t suppose I will ever understand publishing Margot and its obsession with finding something that sells a gagilion copies and then publishing loads of knock-offs that are similar but not nearly as good. I agree with Margot that crime fiction is crime fiction and that next “big thing” is still a mystery. I know my passion lies with reading more Irish crime fiction, reading more women writers period. I’d love to see/read more French and Spanish crime fiction myself. Wish all of it could be made available to us whether they are popular or not (pure fantasy on my part as most publishers will only translate/sell what sells well across the ocean.) Thanks for posting these lists. It’s good to see other Irish crime fiction written by women whose name is not Tana French (love her though). I don’t know about you Keishon but I’m woefully monolingual and it’s something I wish I could change – I read about great stuff being published in other languages and such a tiny percentage is translated into English. Thanks for more suggestions Rob. I have previously read a couple of these but I will seek out as many as I can. I’ve got one by Claire McGowan sitting on my Kindle – I thought it might be the same one, but mine is The Fall (same kind of title in my mind). Will read it soon. Meanwhile, will be very interested to read more of your reports from this challenge. ooooh Moira there was a TV show made last year called The Fall that was set in Ireland which got some good reviews – I wonder if it was based on that book. Jane Casey is one of my favourite crime writers but, although Irish, her books are set firmly in England and so far the Irishness of her detective hasn’t been a major feature. Otherwise I’ve only read some of the male Irish authors, I fear. I have read one of hers and have meant to get back to the series as I did enjoy that one. All fingers crossed, not just one!! Woefully underread here except for French, but one of my favorite short story writers was Mary Lavin. who wrote movingly about the plight of women in the early 20th century in Ireland. And, of course, Elizabeth Bowen. Love DEATH OF THE HEART and HEAT OF THE DAY. Great. I love to see women writers from one side of mt family’s ancestral home. I’ll be reading some of these authors, and will check in here for recommendations. I have this on my shelf so I must get around to it.